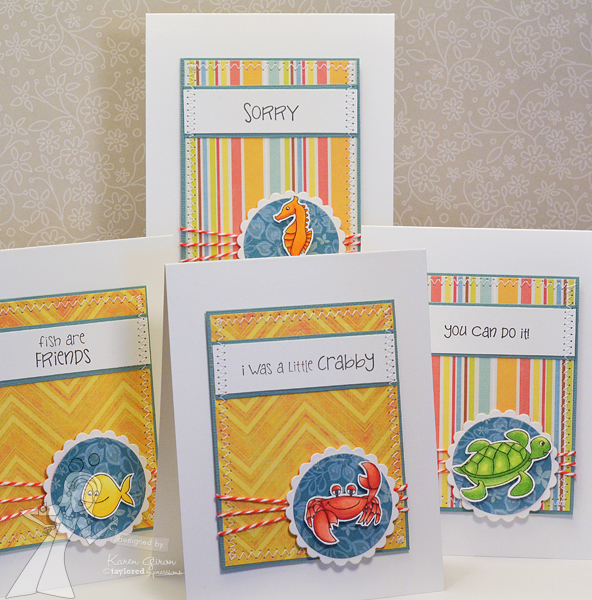 Today it's my turn to showcase Bon Voyage - a new set illustrated by Emily Burger for the Embracing Grace line. I stamped the image in Memento Tuxedo Black Ink on both Choice Snow White Cardstock and Paradise Beach 6x6 paper and paper pieced the waves. 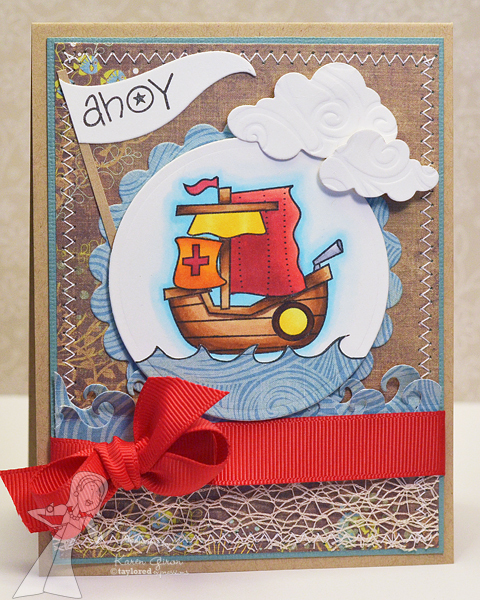 The ship is colored with Copic Markers and I added some fun waves with the Wave Border Die. The sentiment banner is the Fly Your Flag 3 Die, cut in half and then I cut out a thin piece of Kraft Cardstock for the stick. 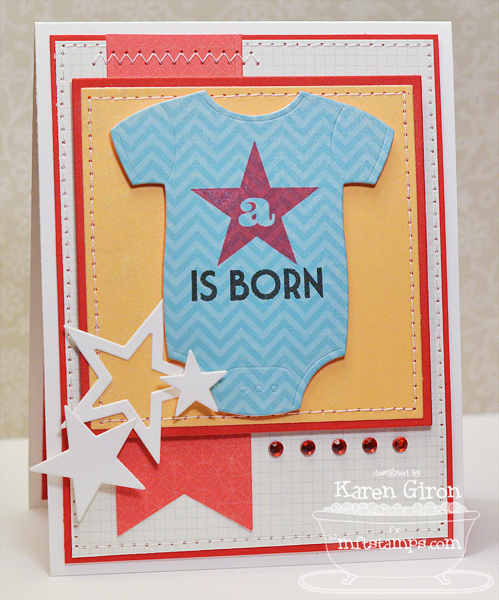 The layout is Jen Del Muro's SFYTT for June. 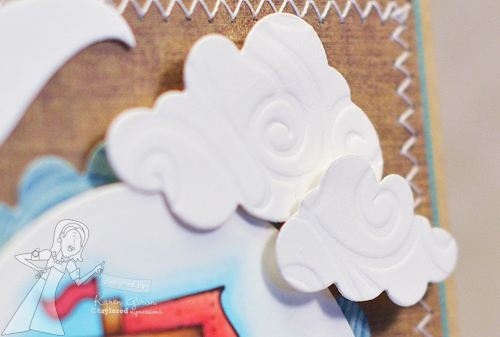 I cut out some clouds with the Cloud Duo Die and then embossed them with the wavy side of the Waves/Bubbles Impression Plate and layered them over the image with Foam Tape. 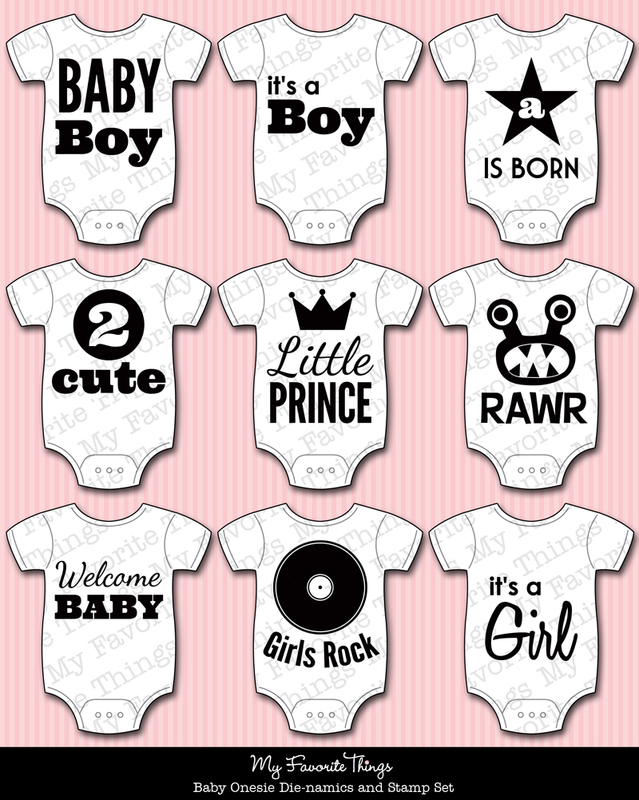 Welcome to day THREE of MFT Teasers! 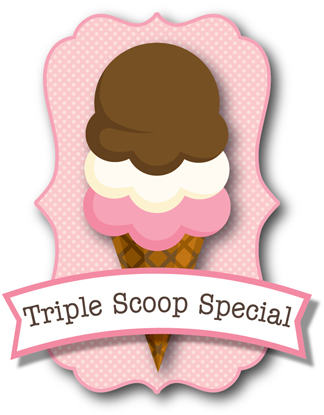 Today, I'm showing a little sneak of Clearly Sentimental about Audrey Hepburn, which is the Triple Scoop set for July. This set is truly fabulous - it's packed full of Audrey Hepburn quotes, in a nice bold font, which make gorgeous, elegant cards. I'm going all black and pink on my card. I started with some Indie Chic Saffron 6x6 papers and the layout from Got Sketch and went from there. 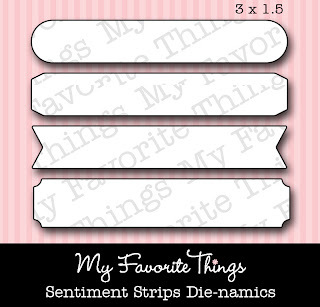 I cut out 3 Sentiment Strips Die-namics and stamped the sentiment on the white cardstock. 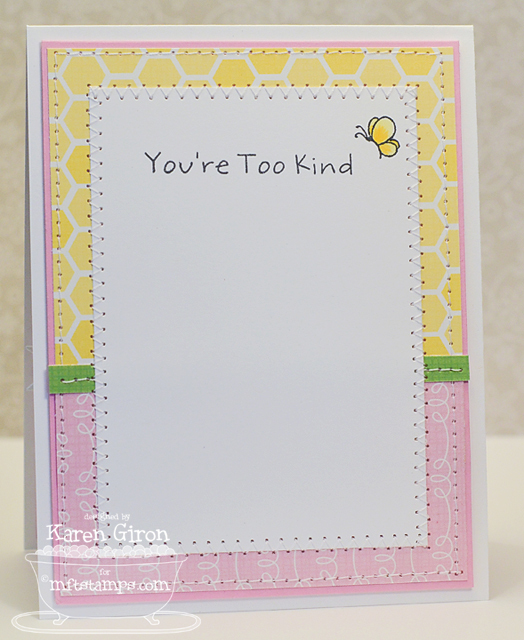 I cut out some pink patterned paper with the Designer Labels 3 STAX Die-namics and then only inked up the "Pink" part of the sentiment and stamped it on the label. 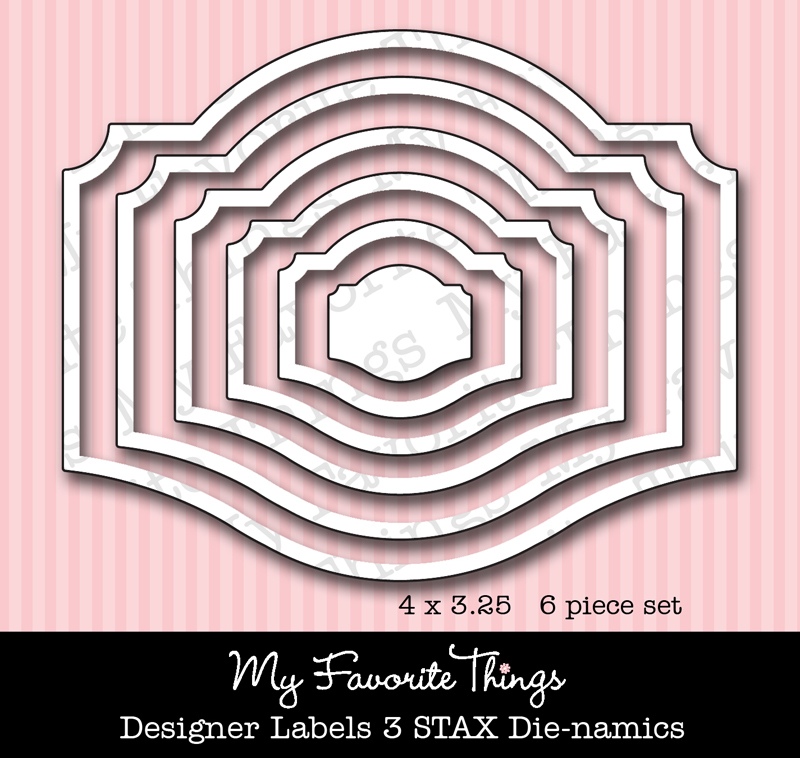 Since it's Audrey, I can't help but think of New York City, so I used the Skyline Border Die-namics in pink and then layered it over 2 of the complimenting Solid Skyline Border Die-namics. Of course, I had to add some pink border bling as well. Be sure to stop by the MFT Blog for a complete list of designers playing along in today's Teaser. 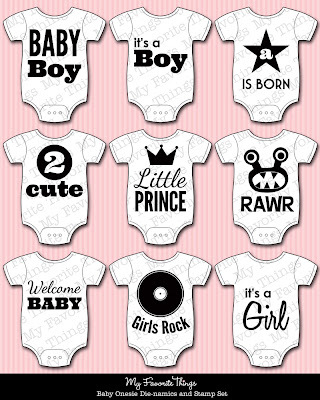 You can find these fabulous items in the MFT Boutique. Hi friends! All of the new Taylored Expressions products are now available in the Fresh Out of the Oven Department! For today's showcase, I have two cards for you. First up is Adventure Land. I started by stamping this adorable carousel on Choice Snow White Cardstock with Memento Tuxedo Black Ink and then colored it with Copic Markers. I used the Seeing Stars Die for the star in the circle and layered it over the Fly Your Flag 2 Die. 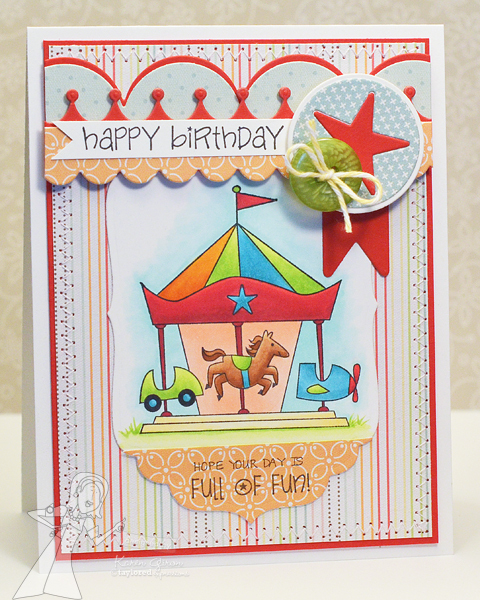 The Majestic Border Die is layered underneath the Small Scallop Border Die, for a fun amusement park tent look. 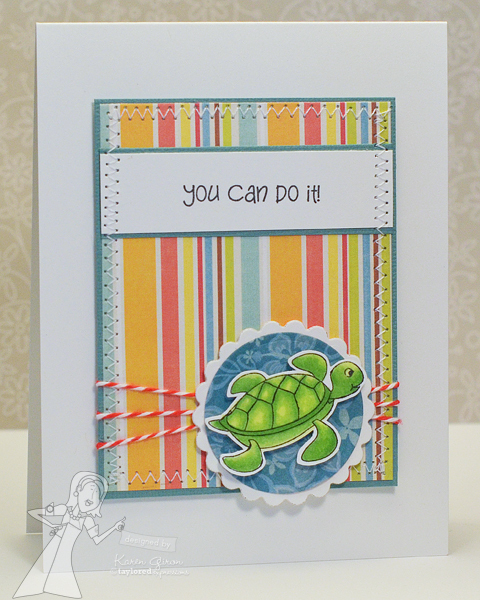 The layout is Monday Card Madness #82. Up next is Life Saver. 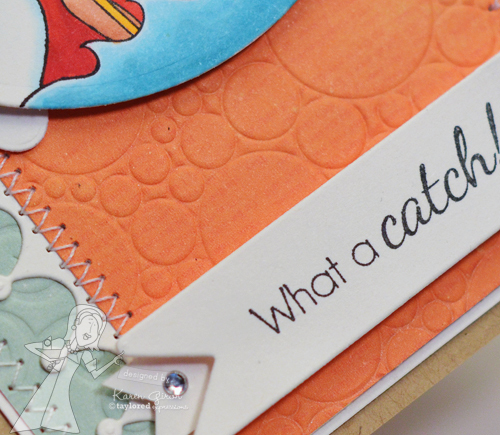 I'm using Jen Shults' DS57 for this card and I grabbed some On the Sunny Side papers. I stamped the life preserver in Memento Tuxedo Black and then cut it out with the Life Saver Die (the die comes with the stamp set - how fun is that??!). I colored the image with Copic markers and then popped it up over some Ladybug Doodle Twine. 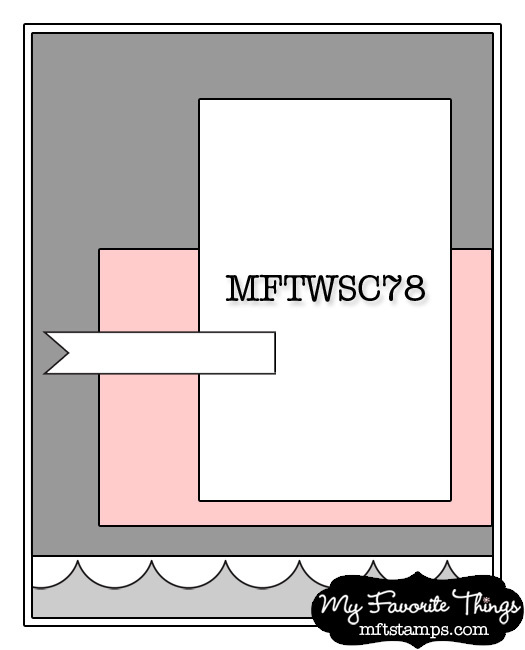 Welcome to day TWO of MFT Teasers! 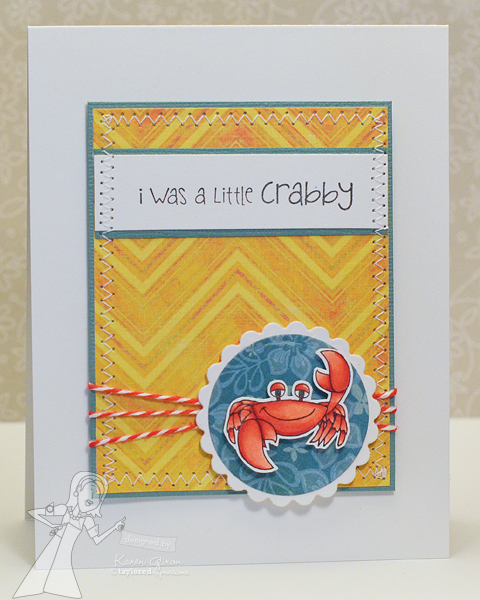 Today, I'm showing a little sneak of Inspired by the Sea. 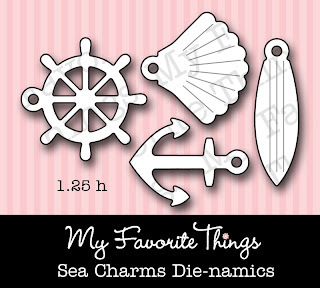 The detail in the Inspired By series is always so amazing and I love this nautical themed set. 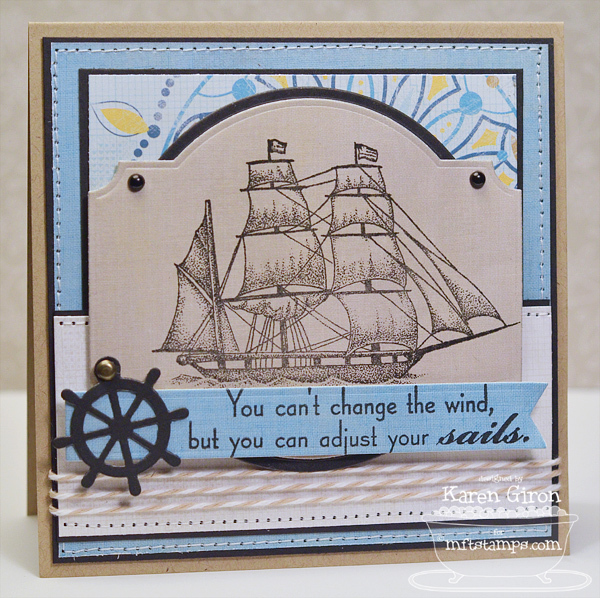 I started by stamping the boat in Brilliance Graphite Black ink on some Indie Chic Nutmeg 6x6 paper, which I cut out with the new Designer Labels 3 STAX Die-namics. 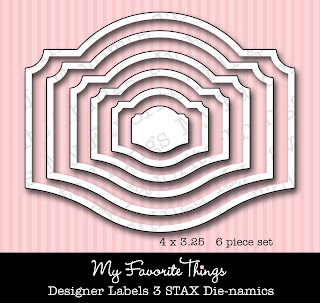 I layered on of the Circle STAX Set 2 Die-namics underneath in Black Licorice Cardstock,which fits perfectly! 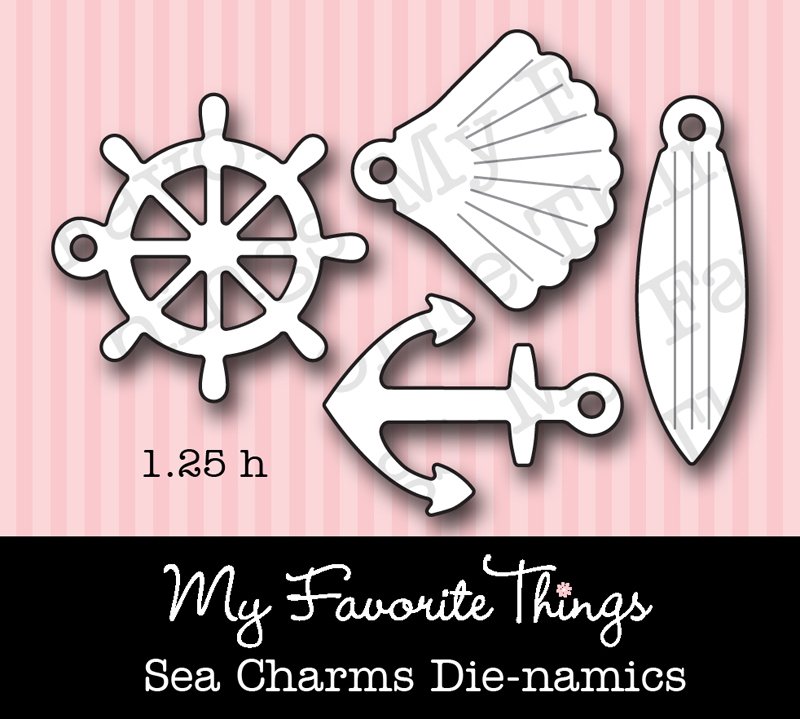 I stamped the sentiment on a Fishtail Flags STAX Die-namics and then added one of the Sea Charms Die-namics on the left. Some Flax Twine at the bottom gives it a nice nautical touch. The layout is MOJO247. Don't forget to stop by the MFT Blog for a complete list of all the designers playing along in today's Teaser. Good morning! The Baker's Dozen Design Team is hosting a pre-release peek of all the new Taylored Expressions sets and dies that will be available in the TE Store TOMORROW! Woot! 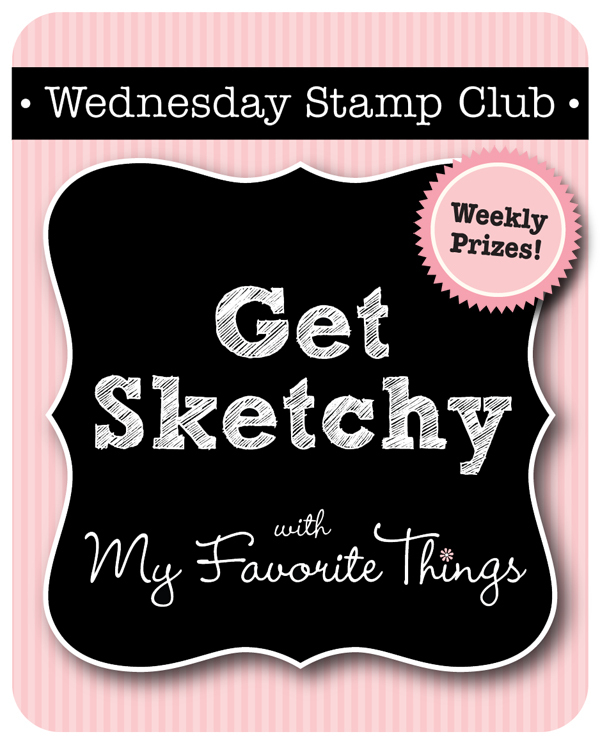 I'm giving you a special sneak of a new Moka - Moka Dylan, which is illustrated by the fabulous Nancy McKinney for her Whimsical Wishes line of stamps. Holy Moka merman muscles!! Tee hee! I stamped Dylan on Choice Snow White Cardstock with Memento Tuxedo Black Ink and then colored him with Copic Markers. I gave him a sun kissed glow, using E11, E13, and E15 for his suntan. I used the Moka Hair & Skin Color Chart to pick some strawberry blond colors for him too. 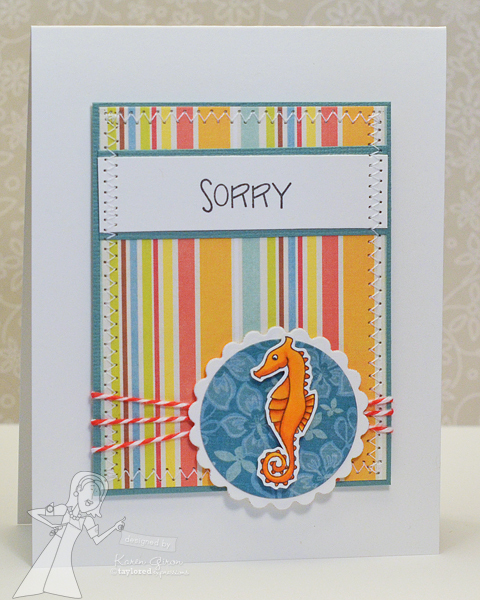 I created all of the little borders with the Majestic Border Die and then used the negative die cut for the scallop look underneath the layered Waves Borders. I used the Fly Your Flag 2 Die for the sentiment flag, and then created a smaller flag to put underneath with some Crystal Twinkles. 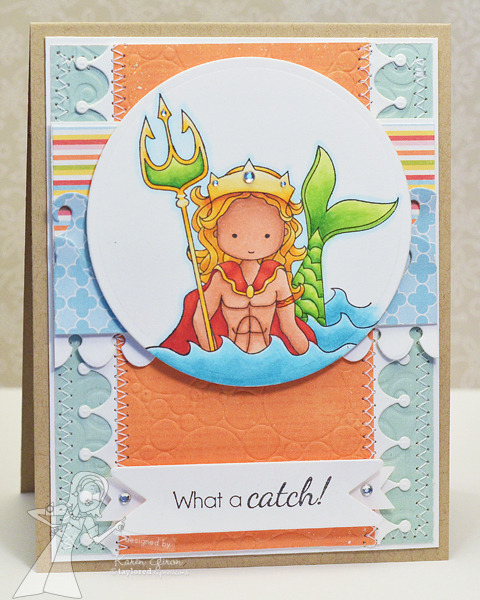 The papers are Hello Summer 6x6 from Echo Park and the layout is Jen Shults' DS56. 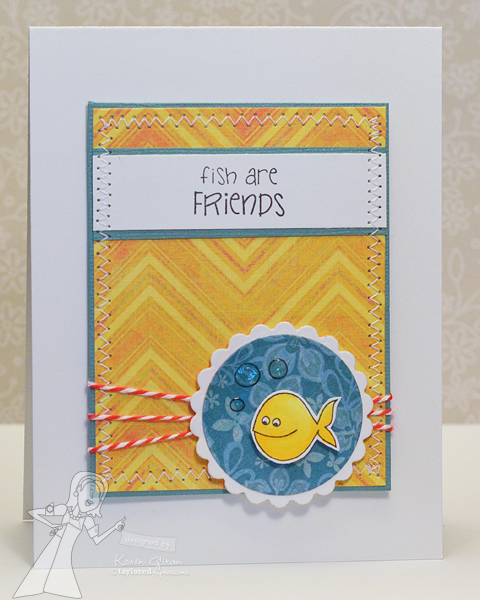 I used the new Waves/Bubbles Impression Plate to create the embossed background - here is a detail shot of the bubbles (the waves are in the blue paper). I made a card using Mouse in the House Blessed Mouse. 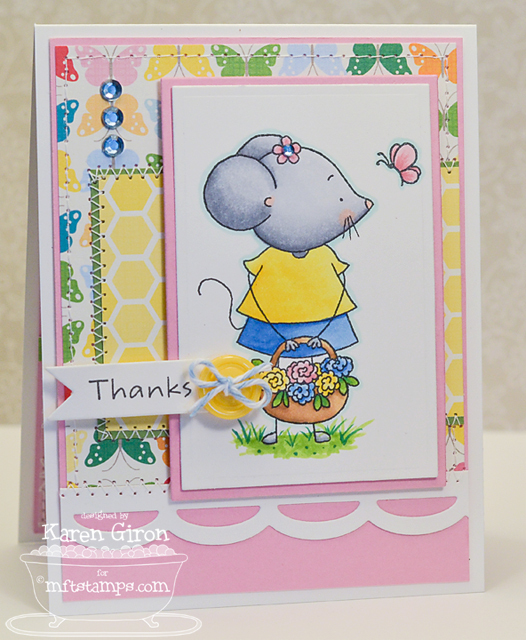 I stamped this sweet little mouse in Memento Tuxedo Black ink on a Rectangle STAX Set 2 Die-namics die cut and then colored her with Copic Markers. I stamped the partial sentiment on a First Place Award Ribbon Die-namics die and then added a little button with some Shore Twine. 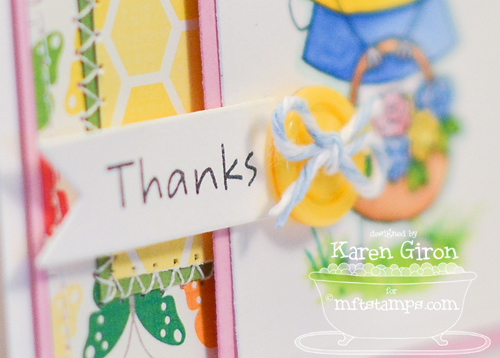 I stamped another sentiment inside the card along with the little butterfly, and have him a touch of color.